Sharon Barcom Hoffer has had a love for theater since she was a child. At age 9, she joined the Junior Theatre Wing of the San Diego Community Theatre (now, the Old Globe Theatre). Her first show was at the Old Globe in The Rose and the Ring with Dennis Hopper. Shortly after, the Junior Theatre Wing set out on its own and became San Diego Junior Theatre. 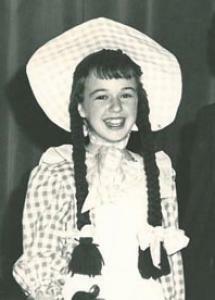 Sharon was Dorothy in its first production – The Wizard of Oz. Nine years and many productions later she became president of the Junior Board of Directors. She also performed at Starlight Opera during her college years. Sharon's career took her in a variety of directions from modeling — to teaching manners — to company training. She was the Human Resources manager for both Bullocks and Saks Fifth Avenue for 20 years. She also worked as a bridal consultant for First United Methodist Church and the U.S. Grant Hotel. She is currently the bridal Consultant for Neiman Marcus. Throughout the years, Sharon’s love of theatre never waivered. She was never far away from the stage, this time as an audience member sharing it with her son, Jeff. She introduced her first granddaughter, Briana to the theater at age 4. Sharon made sure to teach proper manners and how to be a good audience member. When her second grandaughter Morgan came along she too, learned the beauty of live theatre. Briana coined the name “Grandma Red” to refer to Sharon and now even her grandchildren’s friends call her that. San Diego Junior Theatre's 1954 production of Aladdin and the Wonderful Lamp.